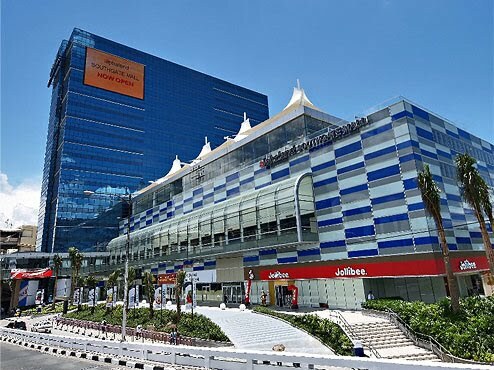 How To Get To Alphaland Southgate Mall? If you are a traveler frequently passing along EDSA, you might have already noticed that the eyesore and unfinished building beside the Magallanes MRT Station has transformed into a shiny and attention-grabbing infrastructure. Situated at the corner of Pasong Tamo and EDSA, just outside Dasmarinas Village, Alphaland Southgate Mall and Tower is the haven of commuters using the Magallanes MRT Station and those getting off provincial buses in Magallanes/Pasong Tamo. The building is redeveloped primarily for commercial lease space with the first five storeys alloted for a shopping mall, serving as the podium of the Tower. The Southgate Tower also offers The Tents Events Place, a 600-pax hall with an area of 650 sq.m. perfect for any occasion. There's also a supermarket (Super 8 Grocery) catering to residents living near the area. This PEZA building also catches the attention of EDSA commuters and drivers with its huge LED billboard (touted as the biggest in the country) showcasing ads and helpful tips to motorists. The LED billboard is so bright that it illuminates most of EDSA and SLEX in the Magallanes area and serves as a trusted landmark for motorists (the billboard is even seen from as far as Ayala)! Consumer and commuter establishment treats in Alphaland include Jollibee, Mang Inasal, Chowking, Goldilocks, Chef d'Angelo, Bean Hopper's Cafe, Sizzlin' Pepper Steak, Le Couer de France, Green Mango, Fruit Magic, Tapa King, Go Nuts Donuts, Reyes Barbecue, Deco's Lapaz Batchoy. Other stores such as Book Sale, D.I.Y., Daiso, CD-R King, Fuji Film store, and various cellphone stalls are also found here. Alphaland Southgate Mall has free wifi too! 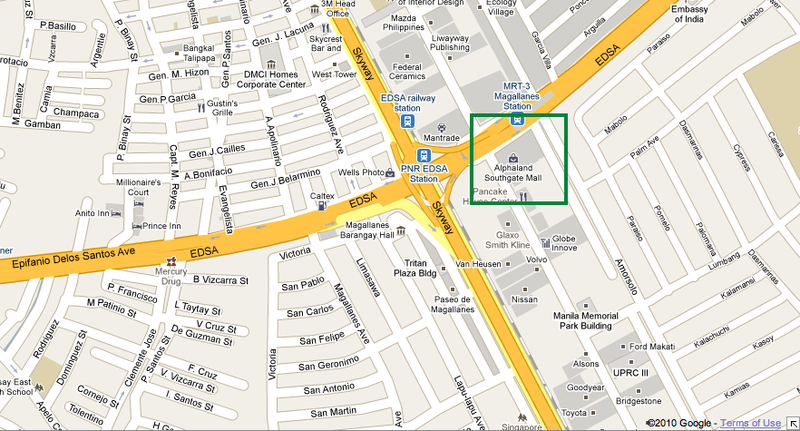 Remember that the Southgate Mall is located at the intersection of EDSA and Pasong Tamo (Extension). Nearest MRT Station is, of course, the Magallanes MRT Station. It is also close to the EDSA-Magallanes PNR Station. Option 1. From EDSA, ride a bus southbound to Baclaran/Alabang and get down at Magallanes. Cross EDSA via the MRT footbridge. Option 2. From EDSA, ride the MRT bound for Taft and get down at Magallanes MRT Station. Option 1. From Pasay/Baclaran EDSA, ride a bus northbound to Monumento/Fairview and get down at Magallanes. Alphaland Southgate Tower Mall is just a few steps away. Option 2. From EDSA-Taft, ride the MRT bound for Magallanes MRT Station. If you are commuting from around Makati, you can take the following jeepney routes "PRC Mantrade Kayamanan C" or "Waltermart-FTI". Option 1. Take a jeepney going to Market! Market! and from there take a jeepney or bus bound for Ayala-EDSA, and then ride the MRT bound for Magallanes. Option 2. 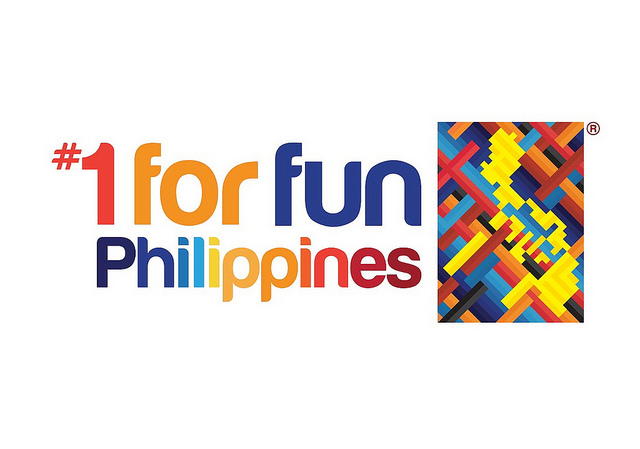 From FTI, ride a jeepney bound for Waltermart. This jeepney passes by Pasong Tamo; ask the driver to drop you off Alphaland Southgate Mall. If you are coming from Manila: ride the LRT bound for EDSA-Taft and transfer to the MRT station and ride the train going to Magallanes. 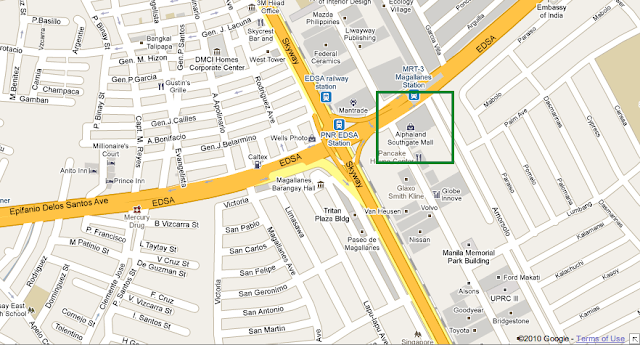 For private vehicles: Alphaland Southgate Mall is located at the corner of EDSA and Pasong Tamo. It is accessible via EDSA southbound (take note, there's another route if you are going northbound in EDSA, see below) and Pasong Tamo. Of course, take note of the MMDA Number Coding Scheme implemented in Makati. If you are coming from EDSA southbound, you have to drive towards Pasong Tamo. This means not using both of the Magallanes flyovers (going to Alabang and Baclaran) and just staying at the right lane. You will be driving for a few meters and then will be forced to take a u-turn directly under the flyovers. Take that and it will bring you to the northbound side of EDSA where the mall is located. If you are coming from EDSA northbound, NEVER take the flyover to cross SLEX and reach the other side of EDSA since that will make you miss Alphaland Southgate Mall. What you need to do is take the route that will bring you to SLEX Manila-bound. Take Don Bosco street - this is the first street crossing the PNR railways from Magallanes. Then turn right at Pasong Tamo and go straight, you'll see the mall in the horizon, just follow the flow of traffic until you reach it. If you are coming from SLEX from the south, take the Don Bosco street - this is the first street crossing the PNR railways from Magallanes. Then turn right at Pasong Tamo and go straight, you'll see the mall in the horizon, just follow the flow of traffic until you reach it. Of course, you can ride a taxicab from any area around the Metro and ask the driver to drop you off "Alphaland Southgate Mall" or "Magallanes MRT Station". Landmarks around Alphaland Southgate Mall: San Lorenzo Place, Dasmarinas Village, Ecology Village, Pancake House Center, Lapanday Holdings Building, Glaxo Smith Kline, Van Heusen, Volvo, Federal Ceramics, Kodak Philippines, Mantrade, Coca Cola Makati Sales Office. Waltermart, Don Bosco Institute of Technology, Makati Cinema Square, and Little Tokyo is just a jeepney ride away (Pasong Tamo - Mantrade PRC). *Alphaland Southgate Mall Tower photo from Alphaland website. 67 Responses to "How To Get To Alphaland Southgate Mall?" Thank you for this free sketch this is very helpful..
Hi, would you know the commute (preferrably jeep) from Buendia in Makati going to Ecoplaza in Pasong Tamo extension? Thank you! Hi anyone pls help me. I'm from pacita complex san pedro laguna. I'm going to pancake house center at 2259 pasong tamo extension makati. How do I get there? Which bus route should I ride.? for the informations you shared!! I hope you will continue to have similar posts to share with everyone! I believe a lot of people will be surprised to read this article! What could possibly be nicer than coming house to a neat, clean and tidy home? Our cleaning solutions cover a wide variety of tasks to free up your time and that means you can focus on the important things in life - family, friends, career and hobbies. STAY OUT OF THIS COMPANY, شركة تركيب مكيفات بالرياض THEY ARE COSTLY, THEY DON'T DO WHAT THEY STATE THEY'LL, MANAGEMENT WILL NOT CARE AND THE CLEANERS DO NOT RESPECT YOUR THINGS. Gutter and downspout cleaning professionals can come in and do this job without placing their lives at risk, and it's really not so expensive. Yelp users haven't asked any queries yet about BA HOME CLEANING. No reply, I emailed her the very next day and I acquired a contact stating that the cleaners experienced that they do the very best they could esp. On the provider شركة تنظيف منازل بالرياض time Blanca and her group arrived within the 1-hour window. Square footage of the house - A larger house will involve more work. A typical home cleaning services takes between 1 and 2 hours, which would cost between $20 and $80. Clients are spending you for a luxury service and they expect and are worthy of top notch cleaning. Similarly, some bring their own cleaning products and others need homeowners to provide a set of products شركة تنظيف قصور بالرياض for their use. Professional home cleaning and maid provider pros may help you ensure that you get the proper home cleaning and maid provider services showing off your home to its greatest advantage. Kimpton Resorts and Restaurants - 2 times ago - save work - more... Normally, the more regularly a maid provider comes out to your dwelling, the less you will be charged you per go to. Then you will have a successful way to اسعار شركات تنظيف المنازل بالرياض market your cleaning services and your customers will halp you get their friends to use your service aswell. While we do clean in teams of three most of the time, there are times when one of the cleaners takes a day off. With the software you do not need to send your gadget anywhere FRPBypass The FRP removal process draws from mins just systems. Glad to find the direction! Thank you! Driving in unfamiliar place is hard. Comply with the overview of register for an account the only point. Kahoot Sign Up This game is basically paid by teams about any type of space topics. I meet a gay person, I have to distinguish between their being gay and being part of a lobby. If they accept the Lord and have goodwill, who am I to judge them? They shouldn be marginalized. The tendency (to homosexuality) is not the problem. Howard decided this job fell squarely on his 73 year old shoulders. Besides being the place's biggest booster, a letter from him packs a certain amount of clout. He has made a career out of chronicling our city's ephemera. Paulo has been around for years, including basketball shirts playing bass with the Chris Harland Blues Band. eclipse t shirts Guitarist Don Ryan has a wealth of experience across many genres, with a brush of the blues in the Blue Healers. Drummer John Fraser (having also played with CHBB) has been honing his blues skills with the band since the start.